THE natural order of plants to which the Erythrina belongs has had various names given to it. The one in common use is Leguminosa, derived from legume, which is the kind of seed-vessel the plants of this order generally bear. 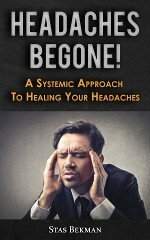 Dr. Gray defines a legume to be "a seed-vessel of a solitary carpel which normally dehisces only by the ventral suture," that is to say, having a seed-pod which splits open by its front side, when it splits open at all. But there are carpels in other plants besides those of the Leguminosa, which split open in this way, and so this order has no exclusive right in nature to the name. Other botanists, Lindley particularly, take one genus as the type around which the order should close, and which should then give its name to the whole; and for this the botanist named selected Faba, and for the order Fabacea. As nearly all the orders are named in such a plan, there seems no valid objection in the case of the present one; but leading botanists have not adopted it. Papilionacea usually divides with Leguminosa the favor of botanists. This is derived from papilio, the Latin name of the butterfly, and is suggested by the fact that the flowers in most cases take on somewhat the form of this insect. But how uncertain these suggestions are as popular guides to a knowledge of the families of plants may be well seen from our present species, in which little trace of the butterfly can be found. It would be much more likely to lead us to imagine a sword fresh from the battle-field. Yet if we set aside popular appearances, and take up the flower in the light of a little botanical knowledge, we shall find that a very slight circumstance has led to this anomaly in this species. In plants of the papilionaceous order, the upper portion of the corolla, called the vexillum or standard, usually curves outwards or backwards, and enables us to see other portions of the structure; but in this case it remains bent downwards, and envelopes the rest of the flower, and indeed this vexillum is all we see in the illustration on our plate. This closed habit is somewhat characteristic of our species, for the well-known coral plant of gardens, Erythrina crista-galli, a Brazilian species, has an open and more nearly butterfly-shaped corolla. The objects of these peculiar behaviors of flowers have become subjects of very interesting studies since attention has been directed to them by the observations of Mr. Charles Darwin, who regards the various forms of flowers as having relation to questions of pollenization. He mentions Erythrina in one of his works as a case where the flower cannot make use of its own pollen without external aid. One of his correspondents tells him that one in New South Wales produces seeds when the flowers are disturbed by hand as an insect would move them. Under culture we do not know of a case where either this species or the Erythrina crista-galli has produced seed, though in the last named plant the writer of this has applied pollen from other flowers on the same plant. As it evidently seeds freely in its native places, it may prove of interest to those who have the opportunity to investigate this matter thoroughly. The seeds are very beautiful, being of a bright, shining, coral color; and those of some species are used in Brazil as a substitute for coral in making necklaces. It may be from this fact that the genus derives its name Erythrina, which is from the Greek erythros, meaning red, though the commentators usually tell us it is so called " from the color of the flowers." To some of the botanists, anterior to Linnaeus, it was known as Corallodendron - literally the " coral tree." The earlier descriptions of the genus were not as perfect as they might have been. Linnaeus made a two-lipped calyx an essential part of Erythrina; and Rafinesque, who edited the collections made by Robin, a French traveller in Louisiana, finding this one had a calyx regularly divided, made a new genus of it under the name of Xypanthus - or literally " sword-flower," a very good name if the genus had been allowed to stand. But the meaning of the names of plants must not be depended on as a means of identifying a species. This species of Erythrina was called herbacea, because it seemed to die to the ground every year. But it does not always do so. 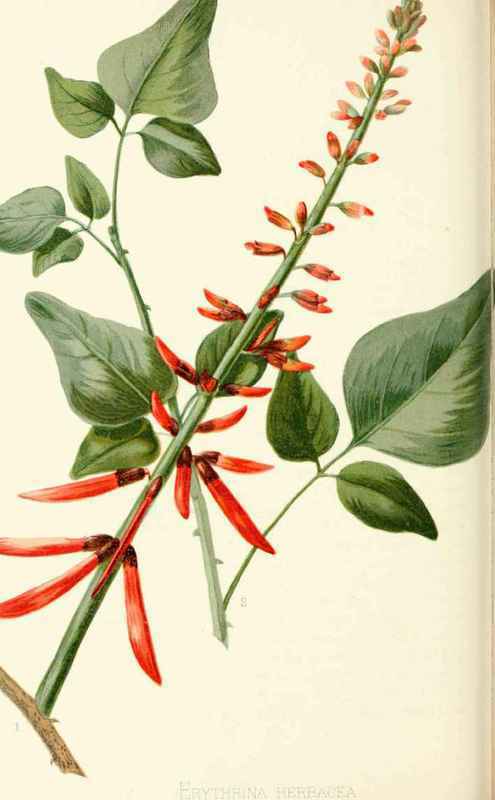 Dr. J. G. Cooper, in a note "on the Forest trees of Florida," published in the "Smithsonian Report" for 1860, says the "Erythrina herbacea assumes almost a tree in Florida, growing twelve feet high, and is then scarcely distinguishable from E. Corallodendron, the coral tree of the West Indies, which grows twenty feet high. Its wood is very light, corky, and may be of use in the place of cork - but the wood of the latter named species is hard." Under cultivation a portion of the base of the stalks retains vitality through the winter, and it is from this last season's wood that the flowering branch proceeds in spring (Fig. 1). Lower down, and from the woody root stock, the new growth (Fig. 2) pushes, and from the base of which perchance a flowering shoot may issue the next spring. The root stock, almost wholly under ground, is thick and somewhat fleshy, and is spoken of by some authors as a " tuber," or "rhizome" by others; but it is little less than a real trunk, though a dwarf one, as in other trees or shrubs. But after all these terms represent mere modifications of the same one thing - a stem or trunk, - and while the names are useful as leading to precision of expression, they are apt to mislead if taken lor distinct things. Barton, in his "Flora of North America," figures a specimen which had been grown in Bartram's garden, and which he says was near four feet in length. This is unusual. Double the length of the one we have given in the plate is about the full size in wild specimens. We have selected a small-sized one to suit our page. The seed from which our plants were raised came from Mississippi - but it is very scarce so far to the West. It is more frequent as it approaches the sea-coast, and is generally found in open bushy places, or neglected sandy spots. The individual flowers soon fall, but the spike is nearly a month before all flowering is over. Torrey and Gray say the "corm" is esculent, on the authority of Dr. Boykin; and Dr. F. Peyre Porcher quotes Dr. Mellichamp as authority for the fact that it has valuable medical properties. Its native place of growth is limited to the portion of our territory lying south of Georgia and South Carolina, and between the Mississippi and the Atlantic Ocean. 1. Medium-sized flower spike, proceeding from the wood of last year's growth. 2. Young growth of the barren shoots.